Red Yarn Summer Camps, Workshops & Performances! Things are hopping here at Red Yarn Productions! I’m beginning my fourth week of residency at Vernon Elementary, auditioning a Young Audiences school performance program this Friday, and planning an exciting summer for Red Yarn. Find details on camps, workshops, performances, and a tour below! Got extra milk containers, tire tubes or cardboard boxes? We have been saving materials all year to create puppets out of recycled materials. 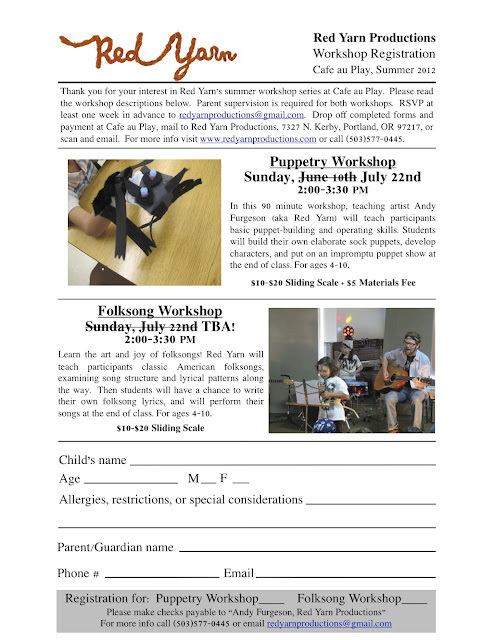 Students will build inventive puppets then write eco-themed puppet shows and songs. The week culminates with a child-produced puppet and music performance. For rising 1st-6th graders. For cost and registration info visit the Friendly House website. Red Yarn is teaming up with a family art studio in Sellwood for this awesome daycamp. During this week-long session students will create papier mache puppets and musical instruments with recycled materials. Then they will develop a musical story complete with original songs. The grand finale will be a Friday performance of the camp’s musical puppet show! For rising kindergarten-3rd graders. For cost and registration info visit the Picassitos website. Get ready to rock! Students will learn skills on guitar, drums, and piano, start their own rock’n’roll bands, write and record songs, and perform in a Battle of the Bands. For rising 1st-6th graders. For cost and registration info visit the Friendly House website. http://redyarnproductions.com/wp-content/uploads/2016/04/bright-red-logo-for-web1.jpg 0 0 Red Yarn http://redyarnproductions.com/wp-content/uploads/2016/04/bright-red-logo-for-web1.jpg Red Yarn2012-05-21 09:25:002012-05-21 09:25:00Red Yarn Summer Camps, Workshops & Performances!